Select a pro-wrestler from the line up and go head to head in a wrestling match. Use punches, kicks, grabs, throws, and dives to force your opponent to submit. If you are held down by the opponent and counted out then you lose. 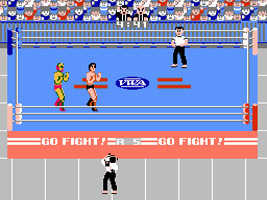 Play through a tournament of computer controlled fighters or play against a human opponent in the 2-Player match.